I think that tatting can be very difficult to display and package especially when trying to sell it, either indoors or outdoors. Some people have been able to create some exquisite displays and I really admire the thought and care they have put into their presentations. 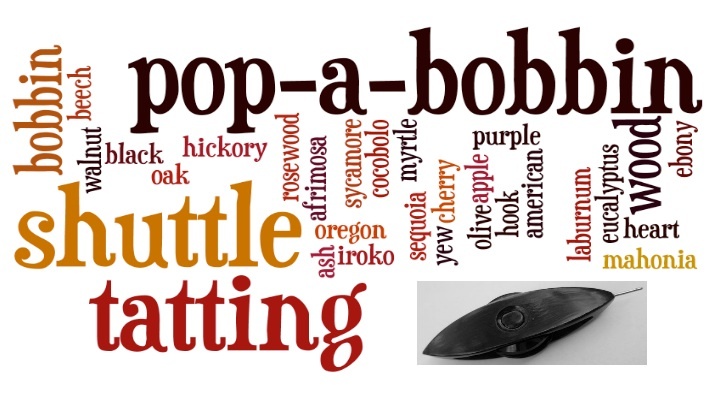 If you can get it right it means that your tatting will attract customers and make them more likely to buy. This isn't a particular good photograph, mainly because it is dull and dreary today and pouring with rain, and the packing is catching the little light there is. However, I am sure you can understand what I am trying to say. We have to be careful that we show our work to the best advantage, but I must admit this is the bit I find the hardest to do. Not all my work is neatly put in packages because I either don't have something suitable, or I prefer the customer to actual pick it up and look at the craftsmanship before they decide to buy. So if anyone has any bright ideas how they present or package their tatting please share. I needed to tat things that are quick and easy, and could be classed as no-brainers! The reason being that I am finding it very hard to concentrate on the doily pattern, but must get back to it some time. So I made some brooches which will go to a Summer Fete to be sold (well possibly) next weekend. I plan to make a few more because after finishing each one I do not necessary like it and want to make a prettier brooch. The pattern I am using is this one , and with adding lots of beads and a large bead in the middle they look quite good. I am trying to think of the colours people will like but not actually sure I have chosen the right ones, so more are going to have to be made! I have been unable to make progress with the patchwork that I showed you on my previous post, mainly because of other commitments. I also really wanted to finish this doily, just one more round and it will be completed. 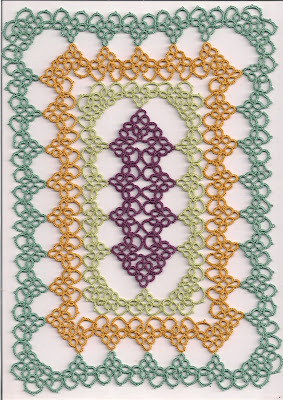 The doily still just about fits on the scanner but obviously will not after the next round! My other project at the moment is making brooches to hopefully sell at a Summer Fete in a few weeks time. However, time is running out and I really need to prepare for our visitors in June, which obviously means some tidying up needs to be done, especially the tatting area!! So many of us have different crafts that invade our lives from time to time pushing away tatting for a short while. I came away from my visit with Jane the other week with some material. This was the kind of material she could not use because the colours were not good or the patterns too large. Fortunately I love the browns and dark bold colours so was pleased to come home with some African fabric. Almost immediately I made a top, and the off cuts will go towards a patchwork hanging I started about 10 years ago! This is a patchwork hanging I must have made about 15 years ago and is beginning to look a bit faded, it is mainly African fabric and hangs over an ugly electric meter in the hall way. With several tatting projects on the go I think there is enough to keep me busy! I have been very busy working in the garden which has included painting pots and furniture and generally getting the area cleared up ready for an influx of tomato plants. Very little time for tatting but manage to pick up the shuttles every now and then. So I was in Romsey today, our nearest town browsing around a charity shop looking at these threads and wondering if I could possibly tat with them. They are hand dyed and come from the USA. 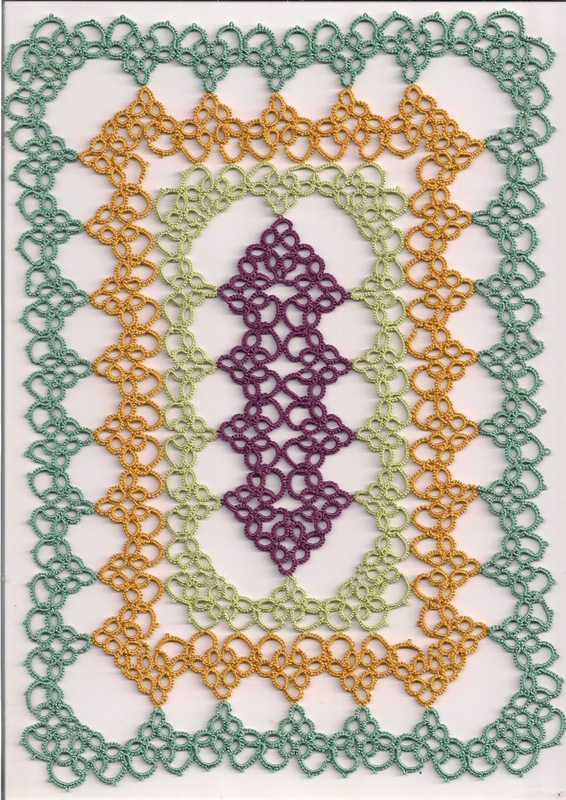 At least the thread is workable for tatting, here is the proof. 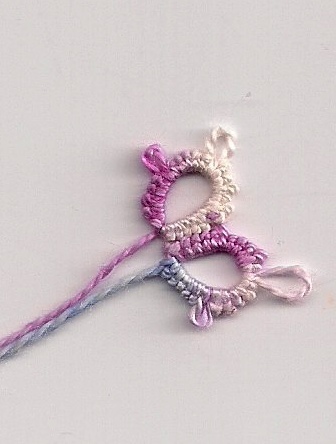 But still wonder what else the threads can be used for as they are so pretty but a little thick for tatting with. Anyway whilst in the shop and deciding whether to bother with the threads I explain that I want to use them for tatting. Immediately a customer heard this and was surprised to learn that some one tats. She had never heard of anyone saying that before, she is self taught and lives in the town. So of course I gave her my e.mail and mentioned this blog, so Carol if you have found it 'hello' and nice to have met you.